Today has been one of the most unusual days of my life. I did not talk all day. If you knew me, you would know this is not my usual way. It seems as though I was listening to the inner dialogue that was going through my mind. It wasn't negative dialogue nor was it positive. It was just words going through my mind that I could not quite understand their purpose...or why they were there. I thought about many conversations I had during my life -some recent and some years back. Yesterday, my ex-husband called. I wasn't home, so he left a message telling me how happy I made him and how those were 15 years that he would never forget. My husband and I were blessed in our union together. We made a very successful team who touched lives and healed hearts...ours as well as others. I called him because something did not sound quite right in his voice. As soon as he answered the phone and heard it was me, he said, "I have bad news, Leia". Then he began to tell me about the results of his angiogram and I could hear in his voice how scared he was. In our fifteen years together and the fifteen years since, scared was a word that I would have never thought I would hear coming out of his mouth. I tried my best to be as loving and encouraging as I could but hung up the phone thinking *DEAR GOD, Please take care of Bob* as I hurried out the door to an afternoon with my friends in Bolinas. The afternoon was the best afternoon I have had in years. I laughed out loud all day. I got in the ocean and I tried to get up on a surfboard but couldn't. 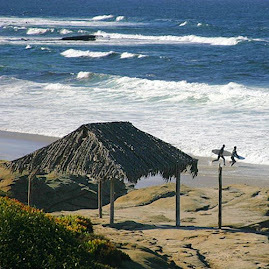 The ocean was my favorite activity for 15 years., when I was fortunate to live on one of the beautiful beaches in our country --Windansea in LaJolla, California. The best of the best surfers lived there and taught me how to surf. My nickname there was THE SOCIAL BUTTERFLY OF WINDANSEA! The best part of this story is not that I couldn't get up on the surfboard but rather that I could even make it out where you wait for the waves. I had to paddle out and meet waves head on to get to the spot where you sit on the board and wait. I sat there waiting and waiting then I would try but mostly I just hung on and felt the power of the sea. In September of 2004, I had a massive heart attack and my LAD (Left Anteria Descending) artery was completely "blown out" of my heart. It is also called the Widow's artery. Few people live through this heart attack and the ones who do are left in a wheel chair. There was absolutely nothing they could do. Brice and I listened as the doctor told us the bad news and Brice looked at him saying "Just fix it" and the doctor responded saying, "she will die". At the time we lived in Hollywood and when we got home, I was so scared. I knew that I was going to die. I just knew it. I could feel the difference in how my body felt and even walking across the room was frightening. The doctor mentioned that I would have to be more careful than ever about what I ate, how excited I got, how cardiac rehab would help but that I was in serious trouble and I had to heed his words if I wanted to live. I was very excited about cardiac rehab but I was too weak to even go at that point so I tried to convince myself that I could make it and that I could heal. The inner dialogue then was something like this: I am healed. I am well. My heart beats perfectly. My heart heals. My heart loves. My heart is strong. My heart is healing. AND SO ON! Finally by November 2005 (14 months after MHA), I was now ready to move forward by going to Cedar's Cardiac Rehab. I was not well at all but I was determined to get better and as I walked into the gym, I knew if I wanted to live, the treadmill and the bike would be how I could. After the nurses put monitors on me, Amanda, the head nurse there, walked with me to the treadmill and I looked at her frightened afraid to step up. Reluctantly, I stepped on the treadmill and I could barely walk. After weeks of 6 day workouts, I could see that I was walking farther and faster but not even close to what I was doing before the heart attack. In May of 2007, after 30 years of telling doctors that I could feel something inside my abdomen and having test after test, my primary doctor again sent me for rule out testing and then sent me to the head cancer doctor at Cedars although the test revealed nothing. When I got to the Cancer Center to my doctor, I smiled because she was a beautiful Irish woman and although none of the tests showed anything, she listened and said, "We'll just go in and take a look''. She sent me for more extensive testing so she knew how to plan the surgery and to try one more time to see if it was showing up in the tests. A week later, I was admitted to Cedars and after being cut from my waist down on one side to right above the pelvic area and all the way across and back to waist on the other side, my doctor found what I had been feeling. A 24 lb mass attached to the abdomen wall completely wrapped around my female organs. She removed it in a very long operation and when I awakened in my hospital room later, I felt like a new woman, even though I had just undergone such intense surgery. When she came in to see me, her comment was "It was like trying to get a sea creature out of your body..it did not want to go. There I was still trying to find balance after a heart attack and now I had to heal the stomach surgery. You can't imagine how hard it was dealing with the pain afterwards. It took me years to get better as each step hurt so badly. The stomach muscles had all been cut and tied so my core was not dong well. The recovery time was over a year before I could walk long enough to even think about working out. I was more sure than ever that my life was going to be short. You may wonder why at age 54, a woman who did not have high cholesteral (olive oil since I was 20). would have a massive heart attack. My heart doctor commented during the angiogram that my arteries were like an 18 year old. THEN HE GOT TO THE HEART and I heard him say "I see the problem" as he brought the stainless slab I as laying on up to the monitor and said "Look at this" as he showed me the artery and how most of it was not there. I could tell by his shocked reaction that what he was seeing was not good. There was complete silence and my mind was going over and over...I am going to die. I had the heart attack because my doctor's partner gave me 40 mg of a pill that I was allergic to. When we moved to the BayArea last year, I cried knowing that I would be leaving my doctors. Once someone seen sees the inside of your heart, there is very special connection that happens! (By the way every 6 months, I check in at Cedars and do two or three days of testing to make sure I am doing well). My doctor did all the tests I needed to make sure there was no signs of more damage and gave me the name of the best heart doctor in the Bay Area. Checking with Dr Anderson was the first thing I did when I got here and to hear his comments on my condition gave me hope. He saw how serious but he could also see in his testing that my heart was not nearly as bad as when the angiogram was done and he told me to bump up my exercise, so I did. I started water aerobics and now I never miss a day. I also do pilates and qigong 3 times a week. Let me jump ahead right here...a few months ago, I had to take more heart tests and when I went for the results, Brice came along because he happened to be home that day. As we sat in the doctor's office, I was really scared. I am always scared waiting for the answers to come. Dr. Anderson said, "Leia this is amazing but your heart now shows absolutely NO DAMAGE. Brice and I looked at each other puzzled...how could that be. I was missing the main coronary artery. I know why because I was determined to get better and I tried my very best to keep my mind positive through the years of being so scared I would die any day. You may wonder why I was so sad today. I was sad because my three friends went back to LaJolla and I felt as though a part of me left with them. They tried to convince to go but my writing class starts again Monday morning and that is where I need to be. I want to create a masterpiece as I write my memoirs of my first 20 years of living on Earth. So, my friends. the moral of the story is: no matter what happens in life, try to face it with all the LOVE you can find inside and ask God to guide you as that is what I did. I am sitting here at 12:30am writing my heart out rather than being dead. That is a happy ending. I love happy endings. May love surround you and inspire you! the photo is a stock image...it is a great photo of the beauty that surrounded me during those years. 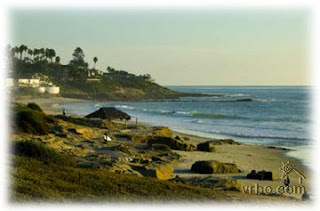 All the beach photos on my blog are of Windansea. I have just finished reading all your blog posts through 2009. I did this rather than watch TV, or even get on Twitter (which is something I've done quite a bit lately).